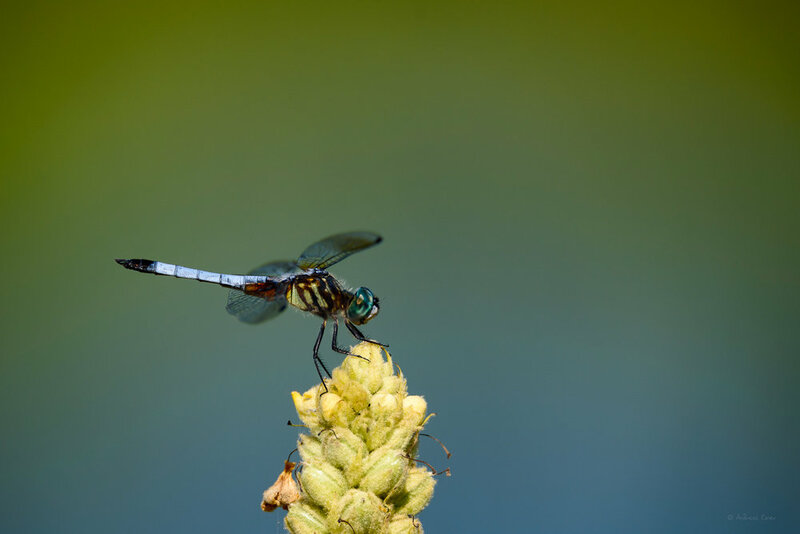 My German photography friend Maren had recently posted some excellent photos of damselflies and dragonflies in her blog (https://marensfotoblog.wordpress.com/2018/07/06/wow-seltene-gaeste-am-gartenteich/). Her pictures always inspire me, and while visiting the Green Island Wetlands last weekend I realized that we have plenty of dragonflies this year. When they perch on a stem of grass or any other plant, you have usually a few seconds to make the shot, and quite often they return to the same spot and may give you another chance if you missed the first shot. The only problem last Sunday was the hot wind that blew over the wetlands and what made getting a sharp image a little bit of a challenge. I thought the key for making a decent photo of the beautiful Blue Dasher was incorporating the background, at least its colors, and without having any clutter in the frame.